DAMAK, Feb 25: Elephant menace has continued unabated in Jhapa and western Ilam, putting lives and property at risk. On Saturday alone, two locals from Birtamod Municipality-7 of Jhapa lost their lives in a wild elephant attack. With this, the elephants have killed three people in just one month. The deceased in Saturday's attack have been identified as Lasune Miya, 70, and Chyanga Rajbanshi, 65. They had entered Sundar Nichajhoda community forest to collect firewood when they came under attack. About a month ago, Somnath Bhandari of Chulachuli-3 lost his life in the same fashion. Localities in Jhapa including Damak, Birtamod and Jalathal have been facing continuous menace from wild elephants. Likewise, the Chulachuli area of Ilam has sustained huge losses from such attacks. In the recent past alone, 30 households in Damak sustained damage to their homes and farms from elephant attack. Likewise, at least 10 households near the district border have been displaced by elephant attacks. With such attacks continuing unabated, locals have demanded action by the authorities against the menace. Bodh Raj Subedi, chief of the District Forest Office Jhapa, said they are taking measures to counter the elephant rampage. According to him, they have submitted a plan to put up electric fencing along the pathways taken by the elephants when entering human settlements. “Our plan is to contain the elephants in the forest areas by surrounding the vulnerable settlements with electric fences. The plan has already been submitted to the higher-ups for approval. The file has reached the Ministry of Finance,” said Subedi. According to him, implementing the plan would drastically minimize the losses from elephant attack. He expressed confidence the plan would be implemented very soon. With the rise in elephant attacks, security personnel have been deployed near the forest areas of the district to keep watch . District forest office chief Subedi informed that joint teams of police and forest guards have been deployed to safeguard the locals from the elephants. Likewise, Damak-3 Chairman Nabin Baral spoke of the lack of support from the government to tackle the situation . 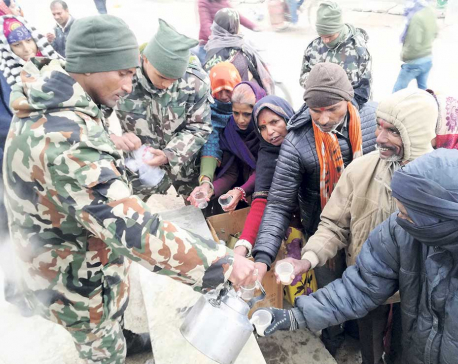 “Police personnel are reluctant to patrol the affected areas while the district forest office doesn't have the necessary means to be of real help,” he said.